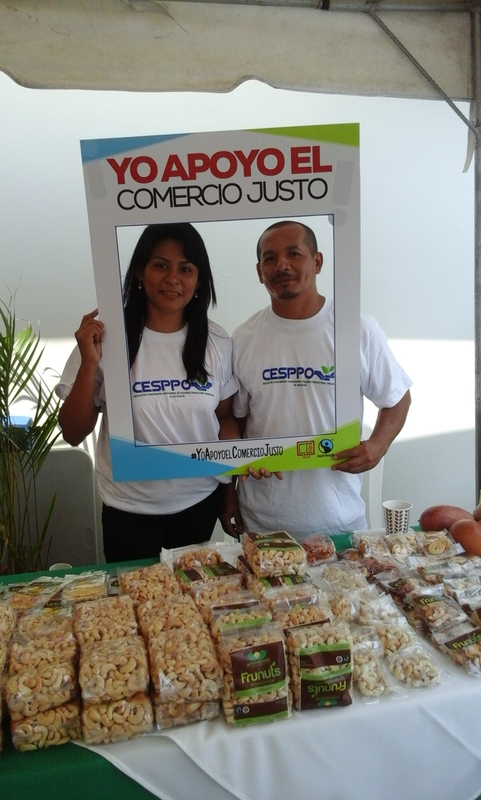 World Fair Trade Day Celebration in San Salvador! | Small Farmers. Big Change. World Fair Trade Day Celebration in San Salvador! “I Support Fair Trade,” says the banner. World Fair Trade Day isn’t just celebrated here in the North. All over the world, small farmer organizations also celebrate World Fair Trade Day at fairs, festivals, and other events. Last Friday, Brenda Ceren, of Aprainores and Eduardo Murcia, Treasurer of Aprainores’ Board of Directors joined small farmer coffee farmers at a Fair in San Salvador, sponsored by Fairtrade International and the Latin American Coordinating Body of Fair Trade Producers. Brenda and Eduardo brought samples of their organic cashews, dried mangos, pineapples, papaya and bananas for the public to enjoy. Bananas: How can something so good be so bad?